At 62 miles long, 18 miles wide and up to 1,600 feet deep in parts, Indonesia's Lake Toba in Northern Sumatra is the largest volcanic lake in the world. The natural beauty of Lake Toba is astounding; Samosir Island rests in the center of the lake and provides the perfect escape from the madness and urban sprawl of Medan, Indonesia's fourth-largest city. The formation of Lake Toba, (Danau Toba in the local language) is thought to be one of the most catastrophic events in Earth's history. A massive volcanic explosion some 70,000 years ago threw enough matter into the air to change the global climate at the time. The super-eruption caused a worldwide volcanic winter which some geologist theorize killed off many species of plants and animals. Volcanic ash from the Toba explosion - sometimes 30 feet deep - has been found as far away as Malaysia! The eruption may have triggered a ripple of extinctions across the world. Toba catastrophe theory suggests the explosion caused a decade-long global winter, almost eradicating several species; the human race may have dwindled to as little as 3,000 individuals in the wake of the disaster. The quiescent Lake Toba now bears few signs of being ground zero for the near-extinction of the human race, the only reminder of the volcanic activity now coming from the lake's warmer-than-usual waters. Swimming in the pleasant, mineral-rich water is the perfect therapy for any road-weary traveler. On the single massive island in the middle of the lake – Samosir – travelers can enjoy a laid-back few days in the Indonesian Batak tribe's cultural heartland. The high altitude of Lake Toba (about 900 masl) allows for a cooler climate than the rest of Sumatra; the mountains, waterfalls and lake views inspire reflection, relaxation, and not a few envy-arousing selfie shots. Lake Toba is a staple on the backpackers' “banana pancake trail”: the traditional villages along its shorelines hold several priceless local experiences, from buying handwoven ulos cloth to watching traditional Batak dances to sunning on Tuk Tuk village's sandy beaches. For more details, proceed to the next page: Things to See and Do in Samosir Island, Lake Toba. Pulau Samosir, or Samosir Island, is a Singapore-sized island in the middle of Lake Toba. Samosir Island is actually the fifth-largest lake island in the world inside of the sixth-largest island in the world: Sumatra. The island was formed by a new volcano cone pushing up through the Toba caldera. Most of Lake Toba's tourism is centered on Samosir Island, mainly in the small village of Tuk Tuk. Plenty of guesthouses, restaurants, and a few bars are present to keep travelers happy in between dips in the lake. A handful of small but interesting Batak cultural sites on Samosir Island are worth checking out. Although the real draw to Samosir Island is the natural setting and opportunity to relax, several small archaeological sites are scattered around the island. Hiring a motorbike or bicycle for the day is the best way to get between sites. Sumatra sits directly on the equator; always protect yourself from the sun while swimming. The ATM on Samosir Island is unreliable; bring enough money from Medan or use the bank in Parapat before taking the ferry. Mosquitoes are a real nuisance around Lake Toba. Read how to protect yourself from mosquitoes. Tourism around Lake Toba has taken a rapid decline; never be afraid to negotiate for a better deal. Read more about haggling prices in Southeast Asia. 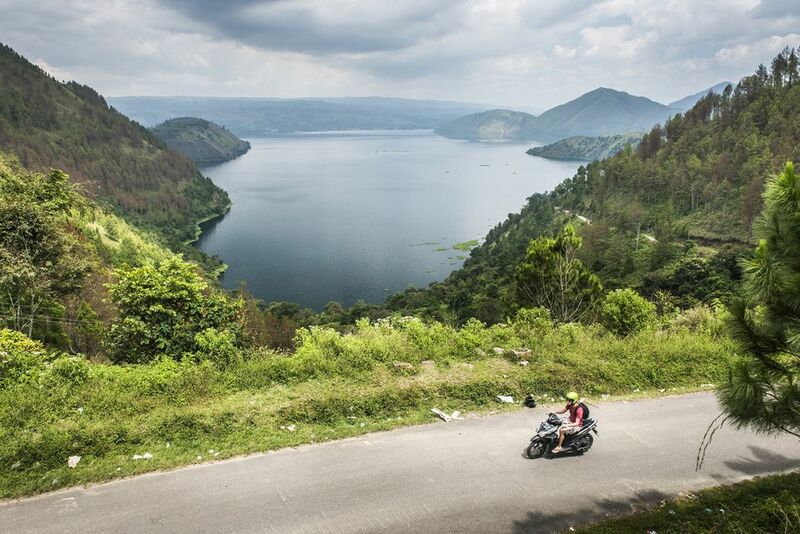 Lake Toba is accessed via the small town of Parapat, around five hours from Medan. Minibuses to Parapat can be booked through your accommodation or from one of the many travel agencies. If you do not intend to look around Medan, exit the airport and either walk (15 minutes) to the nearest bus stand or get a taxi to the Amplas bus terminal. A public bus from the terminal to Parapat takes around six hours and costs less than $3. Unless you leave Medan early, your bus will probably arrive in Parapat after the last boat (6 p.m.) to Pulau Samosir; proceed down Jalan Pulau Samosir – the main tourist strip – to find a hotel. The pier is located nearby on Jalan Haranggaol; ferries to Samosir Island run frequently in 90-minute intervals. The ferries will take you either to Tomok or Tuk Tuk – the former is more traditional, the latter more backpacker-friendly; either will offer places to eat and sleep for your convenience. Visiting Berastagi and trekking Gunung Sibayak are popular activities in Sumatra before or after Lake Toba. Lake Toba, while still popular with backpackers, is not as crowded as it once was. The best time to visit Sumatra is during the drier months between May and September. Lake Toba can become crowded and prices double during Chinese New Year. The next page lays out what to expect when visiting Samosir – the top things you can see and do on the island can be seen on the next click. Once you get safely across Lake Toba to Samosir Island, you can expect the following experiences to unfold in short order – ranging from the natural to the cultural. There's no point to a Samosir/Toba trip if you don't get out and explore. Hire a bicycle or a moto (motorbike) and explore the massive volcanic island on your own, watching rice fields and lake shores give way to impressive mountain ranges. Check out the view from Tele: Just across the narrow strip of land connecting Samosir Island with the mainland is Tele – a tiny town with the best views of Lake Toba and Pulau Samosir. You can climb up the Tele Tower View Point to get incomparable views of the lake and surrounding landscapes. See nature up close: The waterfall in the mountains just above Tuk Tuk takes a pleasant walk to reach; the pool beneath the waterfall is a great spot for swimming. Another, more scenic waterfall requires about seven hours' travel time to reach – the Sipisopiso Waterfall is a tall single fall that crashes onto the northern end of Lake Toba. The steaming hot springs on the western side of the Samosir Island (just across the Pangunguran crossing) merit a visit, however the water is too hot to swim. The Batak represent one of Indonesia's most vibrant tribal communities, generally found inhabiting Sumatra's highlands. They consider Samosir to be the homeland for all Batak; its Mulamula Sianjur Village is believed to have been the first Batak village in existence. See Batak artifacts: Ancient Batak statues, cemeteries, and stone chairs can be seen around the island. The indigenous Batak people are friendly and always willing to share their culture with visitors. Samosir's most prominent cultural towns are usually just a short bike or moto ride from Tuk Tuk. These include Simanindo, where the former palace of the Batak king Rajah Simalungun now stands as the Museum Huta Balon Simanindo, repository of Batak culture from ages past; Tomok, where weathered sarcophagi house the remains of the respected Sidabutar ruling clan; and Ambarita, where ancients sat on stone chairs (still in evidence today) to discuss village matters – and occasionally execute criminals! Watch a traditional Batak dance: Traditional Batak dance performances take place twice a day at the aforementioned Batak Museum in Simanindo. Some guesthouses and restaurants in Tuk Tuk put on traditional music performances at night. The Tor Tor is one such dance. Choreographed to express different meanings and emotions, the Tor Tor is best seen during a Batak wedding ceremony, where the bride and groom must dance it as a matter of course. The native Batak dance called the sigale-gale uses life-size puppets carved from local banyan trees. The mannequins, dressed in traditional Batak garb, dance to a chorus of flutes and drums. Evolving from a funerary tradition (the sigale-gale was meant to house the soul of the recently deceased, if only for a little while) the puppet show can now be seen in several places around Tuk Tuk. Buy Batak souvenirs: The Kain Harum market in Tomok is Samosir's top spot for shoppers, where merchants sell local fabrics and handicrafts in abundance. The Batak are expert weavers, and their handiwork can be bought by the meter from Kain Harum or many other shops around Samosir. The Ulos cloth is their best-known product, a fabric whose patterns symbolize the relationship between the wearer and other members of their community. Thus, no traditional ceremonial is complete without the participants wearing a specific kind of ulos cloth. Another Batak-only product consists of fabric laced with aromatic sandalwood; this “fragrant cloth” stays fragrant even after several washes. Plenty of small eateries and guesthouse restaurants along the main street in Tuk Tuk serve up both Western food and local Indonesian food. Most travelers wander to other guesthouses or wherever the party happens to accumulate on any given night. A reggae bar with excellent views of the lake is nestled above town on a cliff. If you can eat only one local Batak delicacy, try mie Gomak – a curry noodle dish specific to the area, served with square-cut noodles, a mild red curry, and condiments like sambal andaliman (chili paste made from Batak peppers) and kerisik (dry-fried coconut). True to its backpacker-friendly heritage, Samosir's eateries sometimes serve happy pizzas and magic mushroom shakes; both contain illegal drugs. Read more about drug penalties in Southeast Asia, and drugs in Indonesia – do not indulge in these lightly! Visiting Kelimutu, Indonesia? Read This!